In international law, forced disappearance is defined as the arrest, detention, abduction of an individual by or with the knowledge of the state, “followed by a refusal to acknowledge the deprivation of liberty or by concealment of the fate or whereabouts of the disappeared person, which place such a person outside the protection of the law.” The international legal protections against forced disappearance have developed over the past half-century based on the emergence of human rights norms. In contrast with the majority of the literature surrounding norms in international relations (IR), and despite the influence of norms on international and domestic laws and practices, the norms surrounding forced disappearance are far from static or universally agreed upon. In fact, these seemingly obvious central tenets about how forced disappearances are investigated and redressed are constantly being interpreted and re-interpreted, negotiated and re-negotiated with each application. The messy reality of the development and diffusion of norms surrounding forced disappearances further substantiates arguments that IR’s norm theories are too simplistic to account for the realities of international politics. This paper traces the interpretation and implementation of norms surrounding forced disappearances in a variety of contexts over time. The first section outlines the differences between the concept, interpretation, and implementation of norms. The second section highlights key differences based on evidence from four cases. The third and final section analyzes how these differences impact the norms themselves. Ultimately, I argue that the norm theories from IR fail to account for the differences in interpretation and implementation of the norms surrounding forced disappearance. In reality, the concepts of norms that are diffused do not remain static as they are interpreted and implemented in diverse contexts. I argue that three primary norms have developed over the course of the past century that define the requirements for how forced disappearances are addressed. First, forensic human rights investigations are designed to be an objective, evidence-based record rooted in scientific practice to establish what happened to an individual victim. Second, loved ones of the disappeared have a “right to the truth” about what happened. This builds upon the first norm, in that discerning the truth about what happened to someone is achieved in one of two main ways: through legal justice, or through some mechanism of establishing the “truth” that does not rely on the judiciary such as a truth commission. Third, in addition to a right to know the truth about what happened to their loved ones, families also have a right to reparation for what they have lost. This can be return of the remains of their loved ones, and/or it can include some sort of symbolic, material, or financial form of acknowledging their loss. As critical IR scholars have repeatedly asserted, constructivist norm theories fail “to account for the particular form that a norm takes, and for how it authorizes certain forms of behaviour and not others” (Epstein 2017). While analysis of the development of norms is one way of investigating the form a norm eventually takes, I instead consider the differences in how a norm that has been agreed upon at the conceptual level is interpreted and implemented. As Donnelly asserts, “[w]e can identify three levels of abstraction in the specification of recognized human rights. Basic concepts, I will argue, are largely universal. Particular conceptions or interpretations of those concepts have a significant but limited range of legitimate variation. The particulars of implementation, however, are legitimately matters of considerable local variability” (2013, 100). In other words, Donnelly suggests that human rights, (and I argue norms more broadly), can be interpreted in different ways, despite general agreement on the concept of the norm. For example, state signatories to the International Convention for the Protection of All Persons from Enforced Disappearance (CPED) agree at the level of concept that “no one shall be subjected to enforced disappearances”. However, many states deny having committed disappearances, even when families are unable to locate their loved ones who were detained by state forces. States deny having detained these individuals or reject the notion that this practice should be classified as a “forced disappearance” despite it meeting the definition in the CPED. Furthermore, how the diverse interpretations of a norm are implemented varies substantially. Many international legal instruments that codify these norms, including the CPED, provide for some variation in implementation by allowing reservations as part of the ratification process. Germany, for example, while implementing the principles of CPED into its domestic legal system, presented five reservations, including the clarification that, “the envisaged provision on reparation and compensation does not abrogate the principle of state immunity”. Forensic investigations into human rights abuses vary by context, from official, well-resourced state-sponsored exhumations (Kirschner and Hannibal 1994, 453), to unofficial searches and exhumations by family members (Stover, Haglund, and Samuels 2003, 63-66). Forensic investigations may occur immediately after mass violence or disappearances (Koff 2004), or, alternatively, may be delayed to coincide with larger-scale investigations surrounding prosecutions or truth commissions (Ferllini 2003, 223), or may not take place until decades later (Ferrandiz 2006, 7-12). Rosenblatt describes a “growing international consensus about the moral obligation and legal authority to exhume mass graves after atrocities” (2015, 6). The idea that there is a moral imperative and legal authority to investigate disappearances and other such crimes uses human rights based language to capture the dual moral and legal approach to upholding human rights. Many forensic anthropologists and archaeologists describe their work as “speaking for the dead” by restoring their identity to them, and achieving justice for them (The Economist, 2014). In order to demonstrate the wide variation in how the norm of forensic human rights investigations have been interpreted and implemented, this section provides a short analysis of four case studies where disappearances have occurred in some capacity, be it through the practice of forced disappearance as defined by the UN, disappearances due to genocide or mass murder, or disappearances during civil conflict. These four cases have been selected to reflect the global nature of forced disappearances, considering cases on three continents (Africa, Europe, and North America) and to highlight the diverse range of circumstances that contribute to the decision-making processes surrounding norm interpretation and implementation. Between 1962 and 1996, Guatemala suffered a brutal civil conflict between the state and guerrilla forces commonly referred to as la violencia. When a peace agreement was signed in 1996, more than 200,000 people had been massacred, 45,000 more were victims of forced disappeared, and more than a million others were displaced, internally or as refugees (Smith 2001, 62). Over half of the victims were killed between 1978 and 1985 (Warren 1993, 25). Officially, the state military and police claimed to be waging a counterinsurgency against guerrilla forces. However, despite the anti-communist rhetoric, the official Guatemalan truth commission found that the crimes committed in Guatemala were genocide by the state against the country’s indigenous Maya population. Many politicians who were in power during the conflict remained in power afterwards, thus blocking legislative opportunities for justice or reconciliation (Steinberg and Taylor 2003, 450). Due to the scale of la violencia many bodies of victims that have yet to be recovered and identified. The Guatemalan Forensic Anthropology Foundation (FAFG) began its work searching for and exhuming mass graves in 1992, four years before the peace agreement. The FAFG’s goals are: 1) to restore dignity for victims and their families and promote healing, 2) to provide scientific evidence for justice processes, and 3) to create impartial historical documentation of the conflict. Since 1992, the FAFG has exhumed hundreds of mass graves and identified more than 2,000 victims of genocide and forced disappearance at the hands of state forces. Many of the exhumations have led to reburial ceremonies, where remains are repatriated to the individual’s relatives. Notably, in cases where a definitive identification of the identity of the remains was not possible, members of the community have claimed unidentified bodies to ensure a proper burial. The FAFG has also provided forensic evidence in a number of court proceedings related to the conflict, including the Rios Montt trial. The FAFG has provided more than 1,400 anthropological experts’ reports in Guatemalan courts, and have also presented evidence before the Inter American Human Rights Court. In Guatemala specifically, families of victims have been involved in the exhumation and reburial processes. Sanford outlined how the geographic space involved with exhumations – being a site of violence and of subsequent exhumation and reburial requires survivors to come to terms with the history of the site before it can be successfully repurposed as a permanent burial ground for victims of the genocide. The rituals surrounding the exhumation of remains from the mass graves, and their eventual reburial follow traditional Maya ethnic and religious rituals. Thus, survivors are able to fulfill their obligations to the dead, allowing them to mourn. In 1999 and 2001, exhumations in Zimbabwe led to the reburial of victims of a massacre in the Matabeleland region. Spearheaded by the Amani Trust, a victim’s services NGO, the Argentine Forensic Anthropology Team (EAAF) worked with locals to exhume 20 individuals. Based upon recommendations from another non-governmental organization (the Catholic Commission for Justice and Peace in Zimbabwe CCJP), the Amani Trust championed exhumations “to address the consequences for families of the Gukurahundi massacres as part of ‘building true peace’ in a context where perpetrators remained in power” (Eppel 2014, 408). Exhumations were especially important for the community in Matabeleland due to the significance of improper death and burial in local culture. “People in mass graves are also culturally regarded as having aggrieved spirits, or as being in an unhappy state of ‘limbo.’ It takes the tears of the living, shed properly through a decent period of mourning, to release the soul and allow it to be at rest” (CCJP 2007). Despite difficulty in obtaining permission from the government to work in the country, the EAAF conducted exhumations over several years that resulted in massacre victims being identified. Following the exhumations, reburial ceremonies took place, fulfilling the necessary ceremonial and religious obligations in Ndebele culture. As Eppel argued, “when a rural community’s desire to reclaim their dead was placed at the centre of healing processes, reburials had transformative outcomes at the individual, family and community levels” (2014, 405). These community-based transitional justice processes were designed to promote civil society growth and development in the absence of official or national level transitional justice strategies. However, due to the increasingly adversarial nature of the Zimbabwean government, the Amani Trust was banned in 2003, and these types of community-level exhumations ceased (Fontein 2010, 429). Despite the absence of exhumations, calls for the need to deal with the dead continued in Zimbabwe through the early 2000s. 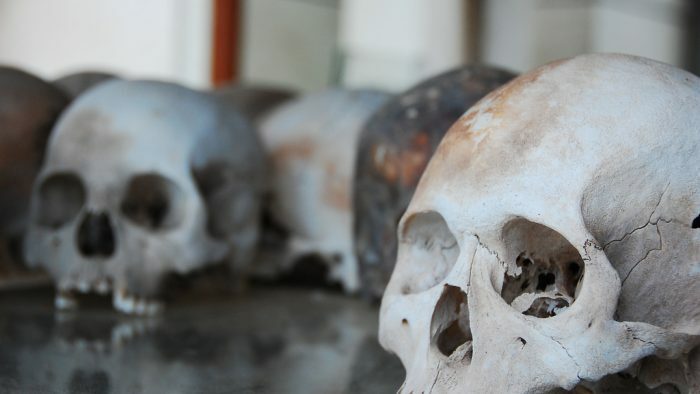 Following the 1994 genocide, the scale of death led to a variety of strategies for dealing with human remains in Rwanda. During the genocide, perpetrators and survivors alike buried the bodies of victims in mass graves to prevent the spread of disease. Later, “many survivors immediately sought to locate, identify and repatriate with respect the remains of their missing loved ones, in order to avoid negative psychological and spiritual consequences. These early efforts were often collaborative, with survivors working together to determine who had died in a given location” (Jessee 2012, 9-10). However, due to the scale of death, these exhumations were rarely successful. In 1995, the International Criminal Tribunal for Rwanda (ICTR) commissioned Physicians for Human Rights (PHR) to “collect evidence for a series of indictments issued by the ICTR” (Jessee 2012, 11) in several locations in Kibuye and Kigali (ICTR, 1997). PHR exhumed remains from approximately 493 individuals and was able to identify 16 with relative certainty. Jessee reported that these exhumations were met with resistance from community members and survivors’ organizations, who were not consulted prior to the exhumations (2012, 12). Furthermore, due to questions about the accuracy and legitimacy of the forensic methodology used in the exhumations the ICTR dismissed the evidence gathered from the exhumations (ICTR 1999, 98). In light of the uproar at the grassroots level about the exhumations, and the lack of legitimacy of the forensic evidence, these exhumations failed. Exhumations have also been undertaken by the Rwandan government, where “surviving family, together with representatives of the [government], would search for the human remains. If located, the bones would be cleaned, wrapped in white cloth and then stored at the local genocide memorial until the start of Memorial Week” (Jessee 2012, 14) Since Rwanda’s primary goal was to preserve evidence of the genocide and promote a particular narrative of events (Lemarchand and Niwese 2007, 180), the government passed law in 2008 that all re-burials must occur at state genocide memorials. However, the requirement of turning over remains of loved ones to the state interferes with the regular grieving process, and contradicts the accepted norm of identifying and repatriating remains to the family whenever possible. In the Rwandan context, the will of the collective supersedes the individual. Thus, the vast majority of the genocide victims in Rwanda remain buried in situ following the genocide, or are interred or displayed in public memorials. If future exhumations were to be conducted, the majority of survivors prefer that if their loved ones are located, their remains should be reburied in keeping with Rwandan traditions (Jessee 2012, 17). As in Guatemala, exhumations conducted in Spain were spearheaded by non-governmental organizations (Rubin 2014, 112). However, transitional justice in Spain was delayed for several decades after the death of dictator Francisco Franco. The Spanish Civil War raged from 1936 to 1939 with substantial human rights violations committed on all sides. Furthermore, following the end of the civil war, violence worsened when Franco commenced an anti-leftist campaign that resulted in more than 130,000 deaths and more than half a million imprisoned (Rubin 2014, 112). After Franco’s death in 1975 until the early 2000s, Spain “forgot” the violence that had been perpetrated, and became the poster child for a model of political transition grounded in actively not dealing with the past. “Central to its workings on the ground was a tacit ‘pact of oblivion,’ whereby major Spanish political actors agreed not to legislate, litigate or discuss the past in the public sphere. As described by one leader of the Basque National Party, the new Spain required an amnesty ‘from everyone to everyone, a forgetting from everybody to everybody,’” (Aguilar 2001, 103). Despite the strategy of forgetting, “[a]lready in the 1970s and 1980s, relatives of the disappeared quietly and without much media attention conducted a series of informal exhumations of mass graves” (Rubin 2014, 105). Families continued to advocate informally, and eventually in the media over subsequent decades, and, following these efforts, a number of civil society organizations initiated work to resolve disappearances through exhumations. “Together with smaller groups, these organizations formed a loose network, comprised mostly of unpaid volunteers, that have sought out, exhumed and publicly commemorated the disappeared” (Rubin 2014, 106). In 2007, under new leadership, the Spanish government introduced the Historical Memory Law to acknowledge the atrocities that happened and the suffering of victims, and provided funding for the recovery of remains from unmarked graves to be reburied in family plots (Hedgecoe 2016). By 2015, more than 300 mass graves containing 6,200 victims had been exhumed. Notably, “unlike forensic interventions conducted by their peers in the immediate aftermath of civil wars and dictatorships, these exhumations were not carried out to support a truth commission, war crimes tribunal or any other juridical process” (Rubin 2014, 107). While some families of victims and a number of civil society organizations continue to advocate for continued exhumations, others in Spanish society “particularly on the political right, want the past to stay buried and the country to move on” (Hedgecoe 2016). The short accounts of forensic human rights investigations in four distinct contexts in the previous section demonstrate the contours of the concept of the norm itself. As agreement at the level of concept would suggest, the same logic has been used to explain why forensic human rights investigations are needed in each of the four cases. And, these explanations echo the explanations from the concept of the norm: 1) to restore the rule of law and human rights of the individual, 2) to establish the truth (an objective historical narrative) about what happened to individuals and what happened to the community as a whole; 3) forensic human rights investigations promote the healing of families and communities. However, despite the fact that the same reasons for pursuing exhumations are given in each context, the investigations appear very different, in ways that go beyond simply differences in resources, or even different cultural priorities regarding the dead. First, who advances these arguments, differs in each context. In Spain, the families were the first to advocate for answers and exhumations, and their requests were mediated by civil society organizations. In Guatemala and Zimbabwe, civil society organizations led the charge and developed strong arguments in favour of using exhumations to fulfill these two mandates. It is unclear, either from the general literature, or from this comparison, what factors contribute to the involvement of particular actors, or what accounts for the major differences in outcomes. This leads to a second, and related point. Finnemore and Sikkink (1998) introduced the concept of norm entrepreneurs, which they defined as local actors (typically NGOs, academics, and members of civil society) responsible for translating global norms into local contexts. However, most discussions of norm entrepreneurs largely fail to unpack the politics inherent in norm entrepreneurship. These individuals and organizations have their own interests, politics, and agendas that remain unexplored. And this trend is evident in the literature surrounding the cases discussed above. In three of the four cases, civil society organizations, largely NGOs, assumed the role of norm entrepreneurs, as Finnemore and Sikkink hypothesize. These civil society organizations played a substantial role in working with families, raising awareness about disappearances, and spearheading the exhumations. However, like the norm theories in constructivism, the literature surrounding these cases does not really engage with the role of these organizations in these processes, beyond discussing that they speak for, or mediate for, families of victims. the discrepancy is often quite large, between what [stakeholders] hope and expect from forensic investigations, on the one hand, and the results that forensic teams are able to produce, on the other. This gap emerges in part because so much of the human rights community’s optimistic post-conflict vocabulary, terms such as “reconciliation” and “closure”, sets hopelessly unrealistic goalposts (Rosenblatt 2015, 43). Second, despite the fact that judicial proceedings have established precedents in the realm of forced disappearance, it is interesting that only two of the cases outlined above have had connections with the judicial system. Only evidence from exhumations in Guatemala and Rwanda has been used in criminal cases, and only in the Guatemalan context has this evidence assisted in convicting perpetrators. Despite this lack of use of the forensic evidence, the literature from all of the cases notes that scientific rigour is an important consideration in the exhumations and experts must always be involved in these investigations. The need for scientific rigour and the use of scientific experts is also important in order to correctly identify individuals for any purpose (repatriation of remains, establishing the truth about what happened to them etc. ), not only for legal justice. However, objective scientific evidence and evidentiary standards for legal justice seem to have become one and the same in both theory and practice. Despite their fraught experiences with state authorities, the memory movement covets the state’s intervention. In fact, these associations maintain positive relationships with many local and regional political figures, who can provide everything from material support for exhumations to symbolic legitimacy via their participation in reburial ceremonies. However, their interactions with the inflexible national bureaucratic and judicial authorities lack the collaborative dynamic of local relationships (Rubin 2014, 116). This explanation highlights what I would argue is the necessity of understanding the relationship with the state in order to truly understand the interpretation and implementation of the norms. In Zimbabwe for example, where there had been no change in regime and next to no involvement from the international community, exhumations were pursued for symbolic and social reasons and were lauded by the families of victims and the communities in which they occurred. Although Guatemala has experienced considerably more substantial external support, the outcome for families has been similar. Rwanda is the outlier of these four cases. By contrast with the other cases that had substantial individual, family, community, and civil society participation and advocacy, the Rwandan government has implemented a highly controlled, top-down transitional justice process, exhumations and public commemorations have been wildly unpopular and have left little space for communities and civil society organizations to determine how to overcome the state of ambiguous loss. In this context, it can be argued that exhumations did more harm than good. Fourth, and finally, what role has the overarching normative framework of transitional justice and human rights had on the interpretation and implementation of norms surrounding forced disappearances? In the cases discussed in this paper, it is clear that the international transitional justice context has been influential in shaping national-level transitional justice policies in some of the cases (such as Rwanda), while being largely ignored in others (Spain and Zimbabwe – with Guatemala falling somewhere in the middle). However, there is little discussion of how this framework influences other levels, such as the expectations of victims and families, the relationships between families, civil society and the state, and even the debate between the justice and healing paradigms. While recognition of these questions is beginning to emerge in more recent literature, these questions have yet to be interrogated. This paper has highlighted not only a series of questions, but also a major disjuncture between the interpretation and implementation of the norms surrounding forced disappearance in diverse contexts. The concept level of the norms suggests a clear paradigm. By contrast, the four cases discussed raise major questions about the very foundations of our assumptions, about the connections between the actors and processes that have been undertaken in each case. I maintain that there are four common areas that contribute to these differences in interpretation and implementation in each of the cases: the role of norm entrepreneurs, the role of legal justice, the role of the state, and the interpretation of the international normative framework. Aguilar, Paloma. 2001. ‘Justice, Politics and Memory in the Spanish Transition.’ In The Politics of Memory: Transitional Justice in Democratizing Societies. edited by Alexandra Barahona De Brito, Carmen Gonzalez Enriquez and Paloma Aguilar. Oxford: Oxford University Press. Catholic Commission for Justice and Peace (CCJP). 2007. Gukurahundi in Zimbabwe: A Report on the Disturbances in Matabeleland and the Midlands 1980–1988. London: Hurst. Eppel, Shari. 2014. “‘Bones in the Forest’ in Matabeleland, Zimbabwe: Exhumations as a Tool for Transformation” International Journal for Transitional Justice 8: 404-25. —. 2006. “Healing the Dead: Exhumation and Reburial as Truth-Telling and Peace-Building Activities in Rural Zimbabwe.” In Telling the Truths: Truth Telling and Peace Building in Post-Conflict Societies. edited by. Tristan Anne Borer. Notre Dame IN: University of Notre Dame Press. Ferllini, Roxana. 2003. “The Development of Human Rights Investigations since 1945.” Science and Justice 43.4: 219-24. Ferrándiz, Francisco. 2006. “The Return of Civil War Ghosts: An ethnography of exhumations in contemporary Spain.” Anthropology Today 22.3: 7-12. Fontein, Joost. 2010. “Between tortured bodies and resurfacing bones: the politics of the dead in Zimbabwe.” Journal of Material Culture 15.4: 423-48. Hedgecoe, Guy. 2016. “Spain glares into bloody past” Politico 29 January 2016. Henderson, Erica, Catherine Nolin, and Fredy Peccerelli. 2014. “Dignifying a Bare Life and Making Place Through Exhumation: Cobán CREOMPAZ Former Military Garrison, Guatemala” Journal of Latin American Geography 13.2: 97-116. —. 1997. “Forensic Investigations of Human Remains at Kibuye Roman Catholic Church and Home St. Jean Complex” 27 November, 1997. http://jrad.unmict.org/webdrawer/webdrawer.dll/webdrawer/rec/194881/view/Kayishema%20-%20Summery%20notes%20Forensic%20inves~tion%20of%20Human%20Remains%20at%20Kibuye%20Roman%20Catholic%20Church%20and%20Home%20St.%20Jean%20Complex.PDF (May 23, 2018). Jessee, Erin. 2012. “Promoting Reconciliation through Exhuming and Identifying Victims in the 1994 Rwandan Genocide.” CIGI Africa Initiative Discussion Paper Series No. 4, July 2012. Kirschner, R.H. and K. Hannibal. 1994. “The application of forensic sciences to human rights investigations.” Medicine Science and Law, 13.5-6: 451-60. Koff, Clea. 2004. The Bone Woman: A Forensic Anthropologist’s Search for Truth in the Mass Graves of Rwanda, Bosnia, Croatia, and Kosovo. New York: Random House. Lemarchand, René and Maurice Niwese. 2007. “Mass Murder, the politics of memory and post-genocide reconstruction: The cases of Rwanda and Burundi.” In After Mass Crime: Rebuilding states and communities.,Edited by Béatrice Pouligny, Simon Chesterman and Albrecht Schnabel. Tokyo: United Nations University Press. Rosenblatt, Adam. 2015. Digging for the Disappeared: Forensic Science After Atrocity. Stanford: Stanford University Press. Sanford, Victoria. 2003. Buried Secrets: Truth and Human Rights in Guatemala. New York: Palgrave MacMillan. Smith, Patrick. 2001. “Memory without History: Who Owns Guatemala’s Past?” The Washington Quarterly, 24.2: 59-72. Steinberg, Michael K. and Matthew J. Taylor. 2003. “Public Memory and Political Power in Guatemala’s Postconflict Landscape.” Geographical Review 93.4: 449-68. Stover, Eric, William D. Haglund and Margaret Samuels. 2003. “Exhumation of Mass Graves in Iraq: Considerations for Forensic Investigations, Humanitarian Needs, and the Demands of Justice.” JAMA 290.5: 663-66. Warren, Kay B. ed. 1993. “Interpreting La Violencia in Guatemala: Shapes of Mayan Silence and Resistance.” In The Violence Within: Cultural and political opposition in divided nations. Boulder: Westview Press. Tamara Hinan is a PhD Candidate (ABD) in Political Science at Western University. She is also affiliated with the Centre for Transitional Justice and Post-Conflict Reconstruction. She completed her MA in Political Science at Wilfrid Laurier University in 2010. Her research focuses on forced disappearances during the Troubles in Northern Ireland.